After a day of internal Discovery/ISS activities, the STS-131/19A and Expedition 23 crews once again focused their efforts on the exterior of the orbiting science laboratory for the second of three EVAs of Discovery’s penultimate flight. EVA-2 required a level of troubleshooting, when one of four bolts proved to be stubborn during the installation of the new Ammonia Tank Assembly (ATA) on the S1 truss. Discovery’s flight crew woke up for their sixth full day in orbit at 9:21p.m. EDT and got right to work preparing for Flight Day 7’s EVA, which is following two days after the highly successful EVA-1. First up today was the repressurization of the Quest Airlock (A/L) back to 14.7 psi (standard Earth sea-level pressure) from its overnight configuration of 10.2 psi for Rick Mastracchio’s and Clay Anderson’s overnight campout operations. After a short hygiene break, Mastracchio and Anderson moved back into the Quest A/L, at which point the A/L was depressurized back to 10.2 psi. 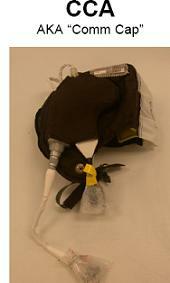 EMU (Extravehicular Mobility Unit) purges were followed by spacesuit prebreathe for Mastracchio and Anderson. Complete crew lock depressurization followed about an hour later. After exiting the A/L, Mastracchio and Anderson will move to the S1 truss segment of the ISS (International Space Station) where they will remove a spent ATA (Ammonia Tank Assembly) from its attach location and hand off the spent ATA to the SSRMS (Space Station Remote Manipulator System). About 1-hr 15-mins into the EVA, Mastracchio and Anderson temporarily tied down the spent ATA to a nearby CETA (Crew and Equipment Translation/Transfer Aid/Assembly) – an operation that took approximately 45-minutes to complete. Mastracchio and Anderson then installed a new P1 radiator Grapple Fixture Stowage Beam (GFSB) before translating to the new ATA – which was attached to a POA (Payload ORU (Orbital Replacement Unit) Attachment). 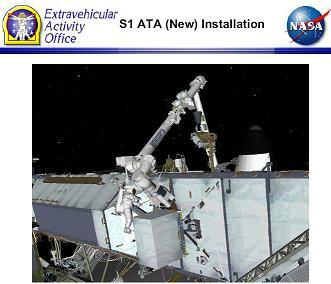 Mastracchio and Anderson will then spent about 30-minutes removing the new ATA from its POA before moving it over to its permanent location on the S1 truss. 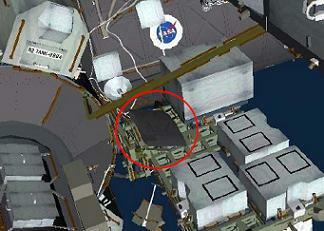 However, a troublesome bolt would prove to be the first hiccip of the mission’s spacewalks. Mastracchio conducted initial installation operations on the new ATA before moving on to the 45-minute procedure of connecting the new ATA to all its necessary coolant lines and electrical connectors on the S1 truss. Conversely, Clay Anderson began initial installation activities with Mastracchio, although a challenge with bolt 4 on the ATA installation took around an hour to resolve. Mastracchio then moved on to ATA umbilical connection activities. 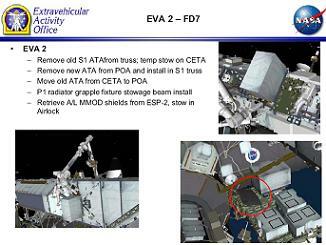 Anderson’s task of relocated an APFR (Articulating Portable Foot Restraint) was deleted, and then reinstated – as managers continued to work the timeline following the ATA issue – before he joined Mastracchio at the CETA cart containing the spent ATA removed at the beginning of the EVA. Together, the spacewalking duo released the spent ATA from the CETA cart and move it to a temporary stowage location – or POA. This operation proved to be the final task of the EVA, due to the issues with the installation of the new ATA. Mastracchio and Anderson’s task relating to the move to the ESP-2 (External Stowage Platform 2) on the ISS to retrieve several A/L Micro-Meteoroid Orbital Debris (MMOD) shields was deleted. Instead, the duo completed cleanup activities, and re-enter the Quest A/L about 6.5 hours after beginning the EVA – ending the mission’s second spacewalk. Following the completion of the new ATA installation and connection procedures, crewmembers inside the ISS were to begin integrating the new ATA into the EATCS (External Active Thermal Control System) loop. However, this won’t be possible at this time, following the deletion of fluid line connection tasks. While EVA-2 was progressing, crewmembers inside the ISS were busy assisting the EV crewmembers and transferring hundreds of pounds of equipment from the MPLM Leonardo to the ISS. Some of the items to be relocated today include three (3) ISP (Information System Panel) units, a TeSS (Temp Sleep Station), RSP rack fronts, and end-cone M-bags. Following the day’s events, the ISS crew will begin their sleep cycle at 1:21p.m. on Sunday, with the Discovery crew going to bed at 1:51p.m. During the overnight period for the crews, the SSRMS will be walked off to the Node-2 (Harmony) PDGF (Power Data Grapple Fixture). As part of the Space Shuttle Program’s (SSP’s) and International Space Station Program’s (ISSP’s) review of past mission anomalies and deltas. Following the highly successful flight of Endeavour and the STS-130/20A mission this past February, post-flight review of the flight’s three EVAs revealed a few minor issues – none of which compromised EVA safety of success. 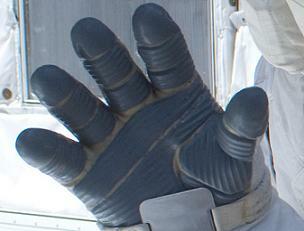 The first issue was peeled back RTV pad on Nick Patrick’s EMU glove at the end of EVA-3. A Failure Investigation Action/Analysis Report (FIAR) was opened following the incident with post-flight inspection confirming no damage to the underlying Turtleskin or Vectran material. The investigation determined that there where no operational impacts to the STS-131/19A mission because of this issue since new TMGs are flown on each mission and each glove is thoroughly inspected before each flight, during each EVA, and after each EVA. “STS-130/EMU 3018 Comm. Issues Investigation: Comm. Issues experienced in EMU 3018 (different CCA [Communications Carrier Assembly] each occurrence),” notes the STS-131 SSP FRR backup EVA presentation. A history of this issue presented in the STS-131 SSP FRR backup presentation reveals three problems spanning STS-129 and STS-130. The EMU 3018 and all CCAs were returned to Earth on STS-130 where there were all inspected and tested. Testing of CCA 1213 revealed a low audio output. Meanwhile, “Post-flight, pre-test inspection revealed damaged sockets on EEH (EMU Electrical Harness) connector” and a FIAR was opened on the EEH. Integrated tests on the CCAs from STS-130 resulted in a repeat of the failure from EVA-2 prep with CCA 1172 as “Poor pin-socket connection can result in low audio/no tones and degrade CCA receivers,” notes the backup SSP FRR presentation.